Our front yard is almost complete. A little over a year ago, we began to dig up and terrace our front yard. Our property is on a hill and there had been a lot of erosion. One of our trees was on a hill and listing toward the street, and we didn’t want it to eventually collapse as erosion uncovered roots. (This happened to our neighbors a week after we moved into this house.) The project started small, with the simple idea of building up the land around the tree with a retaining wall, but it quickly became apparent that the entire yard was going to need to be tiered to prevent further erosion and also drainage damage to the foundation. From March til May last year, things went smoothly…but of course the explosion of our house last summer and the need to completely renovate and repair half the rooms in the house took precedence for months. And as soon as that was done, our plumbing exploded and half the yard had to be dug up. This basically meant that we were starting almost from scratch in October. The goal is to be done by next Sunday, when my extended family is coming over for Easter brunch. We may not get there, but a lot has been done and our yard is absolutely lovely. We did our homework well, choosing an array of local, native plants that require little water, stand up to our crazy summer heat, and thrive in the most ridiculous “soil” ever (basically sand and bricks and rocks with a little dirt mixed in). 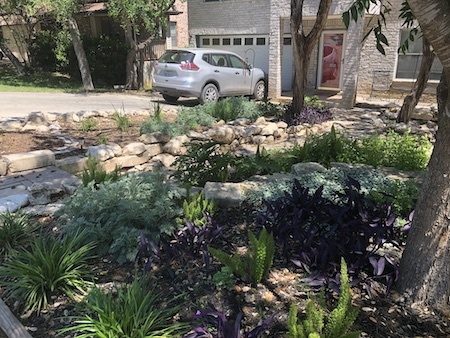 Our yard is fully xeriscaped and much better for the environment than a traditional lawn, and better yet, it’s not just a cactus rock garden. When we started talking about xeriscaping the lawn, that was the first thing that came to mind. It’s what people tend to do around here, because succulents are just about the only plants they know that thrive in our weather. But research taught us that this was simply not the case. We have a cool garden full of green and silver and purple plants, creeping vines that are starting to drape down our rock wall, beautiful pale purple flowers that attract butterflies for much of the year, and so much more. We’ve let the clover grow in to fill spaces, and some of the plants we chose have thrived so well that we’re actually having to cut them back to give other plants space! Honestly, a year ago I could never imagine myself out in the lawn, pulling up weeds with my bare hands and knowing the names of every plant in my yard. I’ve never liked nature! I despise grass. (Seeing photos of bare feet in grass is like a nightmare to me. Really.) 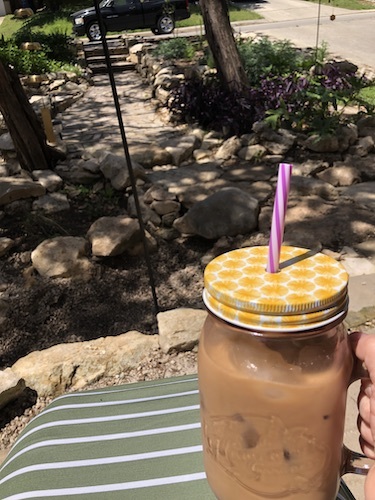 But sitting out on my new porch, listening to the wind chimes and watching the butterflies, feeling the breeze even though it’s 95 degrees outside, feeling the temperature drop twenty degrees between the street and our very cool garden – those things have just become priceless. Every time I see new growth, I’m excited and amazed. I keep going out with my camera to take photos of new things! Seriously, I could never have imagined this. And even though I know we can’t tackle it all yet, I can’t wait until we can plan out our back yard and turn it into a wonderful place as well. It has so much potential. My brain is full of garden ideas!